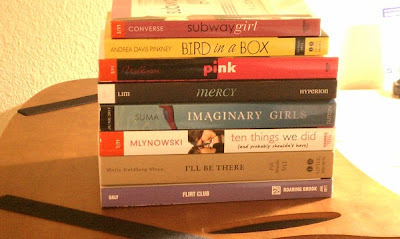 In My Mailbox is a weekly meme hosted by Kristi over at The Story Siren and it allows us to share what we've gotten in the way of books during the course of the week. They can be books bought, borrowed, swapped, received for review, etc. Meanwhile, I've been reading my little heart out and I've been working on reviewing again--although I feel like I'm suffering from a case of reviewer's writing block. >.< ALA Midwinter was a ton of fun and I wish I'd mingled more than I did--admittedly I'm so insanely shy in person that it's pretty crazy. Everyone was so friendly, the weather was great, and well, it was just pretty darn amazing. I must also apologize for the quality of the pictures--I took them with my cell phone which is sometimes temperamental when it comes to taking pictures. D: All release dates listed are of course, subject to change. All links (in the book titles) will take you to their GoodReads pages. I think I just about died (in a very Rachel Zoe sort of way) when I saw Falling for Hamlet--no really, when I saw it, I made for Little Brown's booth because it looks amazing--and I did a silent "Squee!" when I saw that they had Kim Harrison's Pale Demon out over at HarperCollins! Well, I had a lot of "Oh my goodness!" moments and I'm really, really trying not to read Wolfsbane right now (I actually started reading a page and before I knew it, I'd gone another five!) as I've heard that I'll really want the next book after I finish reading it! So, what did you get in your mailbox this week? HOLY CRAP that is a whole lot of AWESOME!!!!!!!!!!!!!!! I hope you had fun at ALA, I wish I lived closer and could have gone. Enjoy all those books, you have so many amazing ones to choose from! I hope you post some reviews on them, Happy Reading! WOAH! Awesome IMMB post! I can't wait to read Wither, Mad Love, Lost Voices, Demonglass(Just got Hex Hall) and I'm soooo jealous that you got Wolfsbane! I just finished Nightshade two nights ago and the cliffhanger killed me! Enjoy! 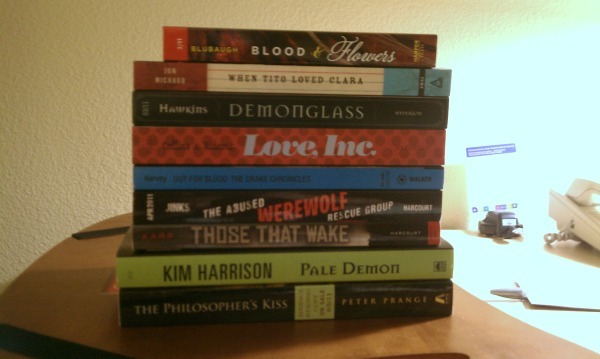 Wow, how did you manage to get so many awesome books! I'd love to read beauty queens, mad love, jenna and jonah, subway girl, pink, ten things we did, populazzi and love inc.
Wow you have some awesome books there, wolfsbane, and demonglass, and a whole bunch more that look really good. oh my gosh! I love your haul!! Freaking AMAZING mailbox. There is too much awesome to take it all in at once! 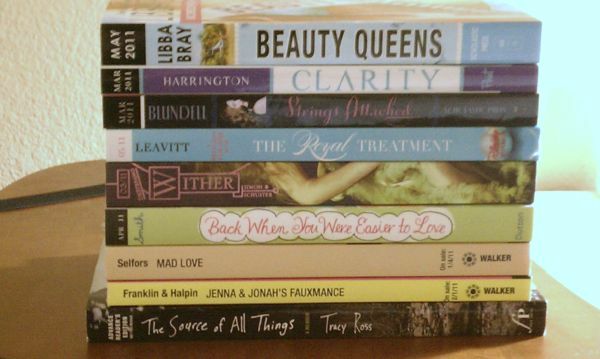 I really want to get my hands on Beauty Queens and Clarity, though. And Back When You Were Easier to Love. And Huntress. And The Revenant. And Wolfsbane!! I can't wait to see your reviews. I'm a new follower! Have a great weekend! WOW! I see quite a few books here that I would love to get my grubby little hands on. Lucky!! I'm glad you got such a great haul. Ooh Clarity is one book I cannot wait to read. Hope you enjoy reading all your books. WOW. That is a phenomenal mailbox week you've had! I would so totally love to get my hands on some of those books, especially Demonglass and Lost Voices and Imaginary Girls and...*trails off and stares at the piles of books* Enjoy!! You are one lucky child!!! Clarity, Wither, Blood & Flowers and Wolfsbane look fabulous. Oh my god, you got Pale Demon! I'm sooo jealous right now. 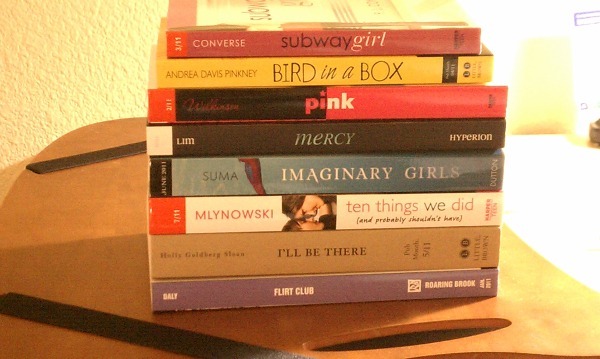 I practically drooling over all of your books, but most of all over Imaginary Girls.I'd love to read it! So jealous that you went to ALA! 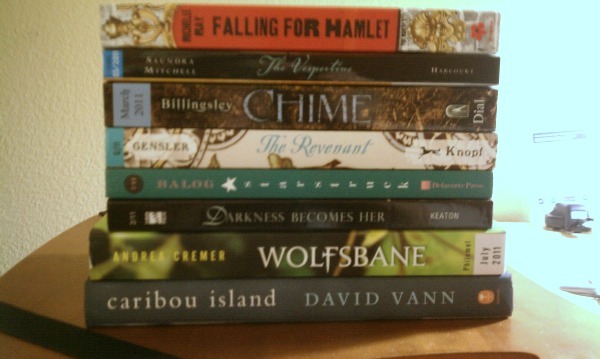 So many good books. I loved Always A Witch. I can't wait for Demonglass. OMG! OMG! How cool is you in my mailbox post! VERY!! Clarity by Kim Harrington looks amazing, every book you got there looks amazing. :) Happy Reading! Wow, awesome bunch of books! I love the cover for Chime. I hope you enjoy them all! Geeeez. How did you manage to haul all that home?? ?/ That's insane. And I can't help but feel very jealous at the moment! Also, I don't think I would be able to stop at one page of Wolfsbane either. Oh wow! I seriously don't know what else to say. That's just...wow! Thanks for sharing yours with everyone! I am so ridiculously jealous! I'm dying to read so many of those. An epic mailbox! enjoy the reading and do come over. My mailbox is also up. Thank you for the heads up about the package. No worries! Wither, the source of all things, pink, and blood flowers have all been looking amazing. CANNOT BELIVE YOU GOT WOLFBANE! 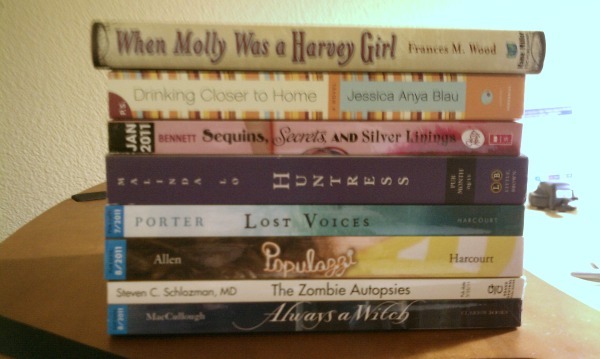 How did you manage to get so many books this week? Your blog is awesome and an inspiration to me as a new blogger! I don't know if you've already been given this, but here's the Stylish Blogger Award! Click the link for more info! And you have Pale Demon! Aaaah!! Enjoy that one, I can't wait till it comes out. It must be February soon, right? Wow, I am so jealous. You have SOO many awesome books. The best IMM l have seen!! I just exploded with jealousy... you are so lucky! Huntress, Demonglass, Wolsbane, Chime, and (bound in an inconspicuous paperback) Beauty Queens! *Sigh*, what a great IMM. Guess you don't have to worry about not having anything to read this year. ;) Hope you enjoy them all!